Date: Friday, March 1, 2019 at 7:00 p.m. 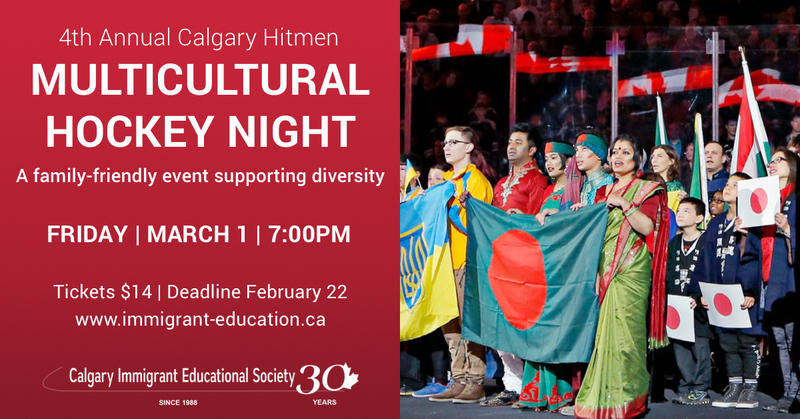 Dedicated to celebrating and showcasing Calgary’s cultural diversity, Multicultural Hockey Night is a family friendly event where people have a chance to win prizes while enjoying an exciting game of hockey and eating pocket dogs, malt ice cream, and popcorn. This event is hosted by the Calgary Hitmen, a junior ice hockey team based in Calgary. They play in the Western Hockey League (WHL) and place their home games at the Scotiabank Saddledome, the same location as the Calgary Flames. Established in 1994, the team is made up of players 16-20 years of age, some of whom are recruited to join the National Hockey League (NHL). A portion of all ticket sales from this page will be donated to the Calgary Immigrant Educational Society. The Calgary Hitmen frequently recognize and honour multicultural communities around the city – including our annual Fill This Basket donation drive and in-school visits. Hockey is Canada’s official winter national sport and Canadians think of the sport as their own. Men and women both enjoy hockey and the only thing better than playing is watching it with your friends and family! Tickets are usually $23.55 but for friends of our school they are only $14 per seat! By buying your ticket you’ll be helping our non-profit charity support language, employment, and settlement training programs for new immigrants who are building their lives in our city. You can buy your ticket online by using the form on the right side of this page. Prefer to purchase by cash? Contact us for ordering. Ticket sales end February 22, 2019. You can pick up your tickets in-person at either our Whitehorn location (3820 – 32nd Street NE) or our Forest Lawn location (1723 – 40th Street SE) from February 25th to February 28th. Our office hours can be found here. Now that you have your ticket, you’re ready to cheer on the Calgary Hitmen! You’re encouraged to wear your home country’s colours or anything else that celebrates your culture – just make sure to dress warm. Multicultural Hockey Night is held each year at the Scotiabank Saddledome. The Saddledome is located at 555 Saddledome Rise SE, Calgary, AB T2G 2W1. Parking is available two hours before an event is there is typically at $15.00 fee. For information on how to get to their parking lots, you can click here or use the map on the right. The Scotiabank Saddledome is conveniently located on major bus routes, but the easiest way to get there is to get off at the Stampede Station of the LRT (train line). Sorry, online ticket sales are now closed! All tickets listed as “for pickup” have been sent to the reception desks at our Whitehorn and Forest Lawn locations.